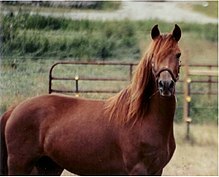 Horses (Equus ferus caballus) are large ungulates, which have had a long relationship with human society. Evidence indicates that horses have been domesticated since around 4000 BC, and throughout history they have played important roles in transportation, agriculture, and war, and are prominent in religion, mythology, and art. Augustine of Hippo, De Libero Arbitrio (388 - 395). 'Til at length into Aix Roland galloped and stood. Robert Browning, How They Brought the News from Ghent. John Carder Bush, in "Control: A translation" (1974). Whate'er was to be done, would do. Ohé, I cry a loud lament for Kalki! The little silver effigies which his postulants fashion and adore are well enough: but Kalki is a horse of another color. James Branch Cabell, The Silver Stallion : A Comedy of Redemption (1926), the character Horvendille, in Book Six : In the Sylan's House, Ch. XXXIX : One Warden Left Uncircumvented. G. K. Chesterton in The Ballad of the White Horse (1911). 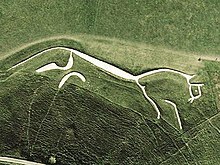 And the White Horse looked on. O God, how long ago. Horse is as everyone can see. Polish: Koń jaki jest, każdy widzi. As much as I like horses — they can keep their cheese. Martin Clunes (b. 1961), in an appearance on the Paul O'Grady Show, Channel 4 television (7 October 2009). And his pace as swift as light. A canter is the cure for every evil. And I saw the heaven opened, and, look! a white horse. And the one seated upon it is called Faithful and True, and he judges and carries on war in righteousness. Who sings as he flies. Eleanor Farjeon, in "Pegasus", St. 3 & 4, from The New Book of Days (1961), p. 181. I told you I would tell you my names. This is what they call me. I'm called Glad-of-War, Grim, Raider, and Third. I am One-Eyed. I am called Highest, and True-Guesser. I am Grimnir, and I am the Hooded One. I am All-Father, and I am Gondlir Wand-Bearer. I have as many names as there are winds, as many titles as there are ways to die. My ravens are Huginn and Muninn, Thought and Memory; my wolves are Freki and Geri; my horse is the gallows. Neil Gaiman, American Gods (2001), Mr. Wednesday to Shadow. You have seen bigger horses than his thirteen and a half, perhaps fourteen hands, his nine hundred pounds. You have seen handsomer profiles than this Roman nose, slightly convex. Burrs cling to his long sweeping tail. His coat is dark and unglossed. Yet look again, while he is still, for he will not be still long. Sense the vitality in those muscles, trembling beneath the skin; see the pride in that high head, hear the haughty command to his voice. For this is a wild horse, my friend. Once he claimed the western range. Then they took his range away from him. But nothing, no one claims him. He feels the wind and the air with his nose, with his ears, with his very soul, and what he feels is good. He tosses his head, once, quickly, and behind him his harem of six mares trot up to join him, and behind them, a yearling colt, a filly and two stork-legged foals. Coats dusty and chewed, tails spiked with bits of the desert, sage and nettle and leftover pine needles from winter climbs down from timberland. The Barb-nosed stallion led his family down to the waterhole. Not Barb from barbed wire, though perhaps the chewed skin was from barbed wire, but Barb from the Spanish horses from which he descended, brought to the New World over four hundred years ago, from the Barbary states of North Africa, Tunisia, Morocco, Algeria, Fez, [w:Tripoli|Tripoli]]. Indians stole them from the Spaniards; the Barbs stole themselves free from the Indians. Running wild, a few still run free. "It was not always so," he said slowly. "When I was a boy—stealing horses was not a crime. It was the way of a brave man, a warrior. Horses then served the purposes of the tribe." He could tell them more, but what he could tell them would perhaps disgust them, confuse them. He had told them enough. Tomacito could have told how Indian tribes rode horses, and when the horses grew old and useless, or when the tribe grew desperate for hunger or for shelter, they drank their horses' blood, stripped their hides for teepees, ate the flesh. Cruel, yes, but necessary. They bought horses, traded for horses, and if they had to—and often they had to—they stole horses. The Spaniards came, and then the white man, and they had horses, and the Indians had none, in the beginning. The white man and the Spaniard, on horses, chased the Indian from his own land. The Indians, on foot, were easy to chase, to hunt down, and kill. With horses, the Indians could stand and fight and die, or run and hide and live a little longer. It was an unfair fight from the start, even with horses, but without horses, it wasn't a fight at all. It was a massacre. Half asleep as they stalk. Thomas Hardy, in "In Time of 'The Breaking Of Nations'" (1915), from Moments of Vision (1917). Morgan! — She ain't nothing else, and I've got the papers to prove it. Sired by Chippewa Chief, and twelve hundred dollars won't buy her. Bret Harte, Chiquita, as quoted in Hoyt's New Cyclopedia Of Practical Quotations (1922). which had been caressed by the contact of Saci's hair. Quote by Ruyyaka of the Hayagrivavadha, evoking the conquest of heaven by Hayagriva, a horse-headed incarnation of Vishnu, Indian Kāvya Literature: The early medieval period: Śūdraka to Viśākhadatta (1997) by Anthony Kennedy Warder, p. 96. Wild, wild horses, couldn't drag me away. Mick Jagger and Keith Richards, in "Wild Horses", on Sticky Fingers (1971). Hast thou given the horse strength? hast thou clothed his neck with thunder? Canst thou make him afraid as a grasshopper? the glory of his nostrils is terrible. He paweth in the valley, and rejoiceth in his strength: he goeth on to meet the armed men. He mocketh at fear, and is not affrighted; neither turneth he back from the sword. The quiver rattleth against him, the glittering spear and the shield. He swalloweth the ground with fierceness and rage: neither believeth he that it is the sound of the trumpet. He saith among the trumpets, Ha, ha; and he smelleth the battle afar off, the thunder of the captains, and the shouting. Book of Job (39:19 - 25) (KJV). And I saw heaven opened, and behold a white horse; and he that sat upon him was called Faithful and True, and in righteousness he doth judge and make war. His eyes were as a flame of fire, and on his head were many crowns; and he had a name written, that no man knew, but he himself. And he was clothed with a vesture dipped in blood: and his name is called The Word of God. And the armies which were in heaven followed him upon white horses, clothed in fine linen, white and clean. And I saw an angel standing in the sun; and he cried with a loud voice, saying to all the fowls that fly in the midst of heaven, Come and gather yourselves together unto the supper of the great God; That ye may eat the flesh of kings, and the flesh of captains, and the flesh of mighty men, and the flesh of horses, and of them that sit on them, and the flesh of all men, both free and bond, both small and great. And I saw the beast, and the kings of the earth, and their armies, gathered together to make war against him that sat on the horse, and against his army. And the beast was taken, and with him the false prophet that wrought miracles before him, with which he deceived them that had received the mark of the beast, and them that worshipped his image. These both were cast alive into a lake of fire burning with brimstone. And the remnant were slain with the sword of him that sat upon the horse, which sword proceeded out of his mouth: and all the fowls were filled with their flesh. I saw heaven opened, and look! a white horse. And the one seated on it is called Faithful and True, and he judges and carries on war in righteousness. His eyes are a fiery flame, and on his head are many diadems. He has a name written that no one knows but he himself, and he is clothed with an outer garment stained with blood, and he is called by the name The Word of God. Also, the armies in heaven were following him on white horses, and they were clothed in white, clean, fine linen. And out of his mouth protrudes a sharp, long sword with which to strike the nations, and he will shepherd them with a rod of iron. Moreover, he treads the winepress of the fury of the wrath of God the Almighty. On his outer garment, yes, on his thigh, he has a name written, King of kings and Lord of lords. I saw also an angel standing in the sun, and he cried out with a loud voice and said to all the birds that fly in midheaven: “Come here, be gathered together to the great evening meal of God, so that you may eat the flesh of kings and the flesh of military commanders and the flesh of strong men and the flesh of horses and of those seated on them, and the flesh of all, of freemen as well as of slaves and of small ones and great.” And I saw the wild beast and the kings of the earth and their armies gathered together to wage war against the one seated on the horse and against his army. And the wild beast was caught, and along with it the false prophet that performed in front of it the signs with which he misled those who received the mark of the wild beast and those who worship its image. While still alive, they both were hurled into the fiery lake that burns with sulfur. But the rest were killed off with the long sword that proceeded out of the mouth of the one seated on the horse. And all the birds were filled with their flesh. 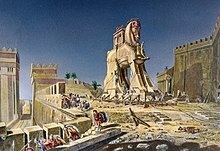 And the watchman told, saying, He came even unto them, and cometh not again: and the driving is like the driving of Jehu the son of Nimshi; for he driveth furiously. Once there was an old man who lived in a tiny village. Although poor, he was envied by all, for he owned a beautiful white horse. Even the king coveted his treasure. A horse like this had never been seen before — such was its splendor, its majesty, its strength. Max Lucado, in "The Old Man and the White Horse" in In the Eye of the Storm (1991). All I know is that the stable is empty, and the horse is gone. The rest I don’t know. Whether it be a curse or a blessing, I can’t say. All we can see is a fragment. Who can say what will come next? To swim the river, villain, and to fly. George Peele, Battle of Alcazar, Act V, line 104. (1588–9). Boy, you should know what you're falling for. Cause I’m coming at you like a dark horse. You know, everyone thinks we got this broken down horse and fixed him, but we didn't. He fixed us. Every one of us. And I guess in a way, we fixed each other, too. Gary Ross, in lines for Red Pollard, as portrayed in Seabiscuit (2003). What a long night is this! I will not change my horse with any that treads but on four pasterns. Ca, ha! He bounds from the earth, as if his entrails were hairs; le cheval volant, the Pegasus, qui a les narines de feu! When I bestride him, I soar, I am a hawk. He trots the air; the earth sings when he touches it; the basest horn of his hoof is more musical than the pipe of Hermes. 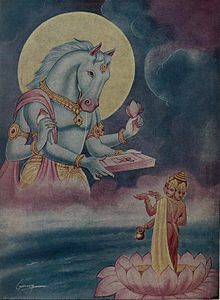 He is pure air and fire; and the dull elements of earth and water never appear in him, but only in patient stillness while his rider mounts him. He is indeed a horse, and all other jades you may call beasts. Piercing the night's dull ear. William Shakespeare, Henry V (c. 1599), Chorus to Act IV, line 10. He's mad that trusts in the tameness of a wolf, a horse's health, a boy's love, or a whore's oath. William Shakespeare, King Lear, Act III, scene vi. William Shakespeare, Macbeth, Act II, scene iv. William Shakespeare, The Merchant of Venice, Act I, scene ii. An two men ride of a horse, one must ride behind. William Shakespeare, Much Ado About Nothing (1598-99), III. 5. For young hot colts being rag'd, do rage the more. William Shakespeare, Richard II (c. 1595), Act II, scene 1, line 70. Give me another horse: bind up my wounds. William Shakespeare, Richard III (c. 1591), Act V, scene 3, line 177. William Shakespeare, Richard III (c. 1591), Act V, scene 4, line 7. Taken from an old play, The True Tragedy of Richard the Third (1594). In Shakespeare Society Reprint, p. 64. William Shakespeare, Venus and Adonis (1593), line 295. Their shoes were on their feet. There is no secret so close as that between a rider and his horse. Robert Smith Surtees in Mr. Sponge's Sporting Tour, chapter 31. J. R. R. Tolkien, The Two Towers; this is a song sung by Aragorn, which was inspired by the Old English poem, The Wanderer. Do not trust the horse, Trojans. Whatever it is, I fear the Greeks even when they bring gifts. Virgil, The Aeneid (19 BC), Book II, line 48. Quadrupedumque putrem cursu quatit ungula campum. And the hoof of the horses shakes the crumbling field as they run. Virgil, Æneid (29-19 BC), XI. 875; cited as an example of onomatopœia. His neck is high and erect, his head replete with intelligence, his belly short, his back full, and his proud chest swells with hard muscle. Virgil, Georgics (c. 29 BC), III. 79. The Wanderer an Old English poem, of unknown origin and date. [S]ome men appeared drawing out the dead beast, a miserable mass of flesh still fastened in the rope net; they left it in the midst of the puddles of melting snow. The surprise was so great that no one prevented the men from returning and barricading the door afresh. They all recognized the horse, with his head bent back and stiff against the plank. Whispers ran around: "It's Trompette, isn't it? it's Trompette." It was, in fact, Trompette. Since his descent he had never become acclimatized. He remained melancholy, with no taste for his task, as though tortured by regret for the light. In vain Bataille, the doyen of the mine, would rub him with his ribs in his friendly way, softly biting his neck to impart to him a little of the resignation gained in his ten years beneath the earth. These caresses increased his melancholy, his skin quivered beneath the confidences of the comrade who had grown old in darkness; and both of them, whenever they met and snorted together, seemed to be grieving, the old one that he could no longer remember, the young one that he could not forget. At the stable they were neighbours at the manger, and lived with lowered heads, breathing in each other's nostrils, exchanging a constant dream of daylight, visions of green grass, of white roads, of infinite yellow light. Then, when Trompette, bathed in sweat, lay in agony in his litter, Bataille had smelled at him despairingly with short sniffs like sobs. He felt that he was growing cold, the mine was taking from him his last joy, that friend fallen from above, fresh with good odours, who recalled to him his youth in the open air. And he had broken his tether, neighing with fear, when he perceived that the other no longer stirred. The horse is God's gift to mankind. The wind of heaven is that which blows between a horse's ears. Allah took a handful of southerly wind, blew His breath over it, and created the horse. Thou shall fly without wings, and conquer without any sword, O, Horse! Good people get cheated, just as good horses get ridden. Keep five yards from a carriage, ten yards from a horse, and a hundred yards from an elephant; but the distance one should keep from a wicked man cannot be measured. The wagon rests in winter, the sleigh in summer, the horse never. Multiple attributions, earliest located in Social Silhouettes (1906) by George William Erskine Russell, p. 218 wherein a character attributes the saying to Lord Palmerston.